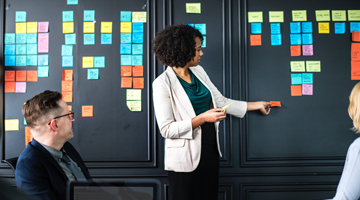 Whether your company is just starting out or you have big aspirations for future growth, every business needs a strategic business plan to guide them in the right direction. Having clear goals matters. Without them, you run the risk of steering your company off track, which could cost you a lot in both time and money. With this in mind, we’ve created a step-by-step guide to better business planning below. Creating a good business plan starts with asking the right questions. These will help you analyse where your company stands currently, where you want it to go, and how you can get there. It also helps you explore current trends in the market, and understand where your business fits in. Where are you now? Take stock of how your business is currently performing. How did you get to this point? Explore what tactics and strategies have resulted in your current success or failure. Where do you want to go from here? Decide what goals you want to accomplish in the next year, five years, or 10 years. How do you get to where you want to be? What steps do you need to take to reach your goal, and how do you go about taking these steps? What obstacles will you have to overcome? Uncover what problems you will have to solve to reach your goal and what your biggest roadblocks will be. How are your customers changing? Has your target market changed how they use your product or service, or are their priorities and values changing? How is your industry changing? Are there disruptive players or technologies that are influencing your place in the market? How do we best serve our stakeholders? Think about your team, your investors, and your customers, and make sure that your business strategy aims to benefit everyone, not just one group. What skills or resources do you need to achieve your goals? Your team may need to be upskilled, or you may need to outsource additional support to reach your strategic objectives. What tools and frameworks to use? There are a number of frameworks you can use to create a good business strategy that assists in the future growth of your company. Which tools you use is completely up to you. Different tools work better for different plans, so make sure you use one that works with your goals in mind, instead of trying to fit your company into all of these moulds. Below are four of the most common frameworks and tools used for building a strategic business plan. Financial: Are you meeting your targets financially? Customers: Are your customers still enjoying your product? Internal business process: Is your company working efficiently? How to create a strategic plan? Now that you’ve identified internal and external factors influencing your organisation and have decided on a clear objective, it’s time to actually create your strategic business plan. This should outline the future direction of the business, and the purpose and values it hopes to fulfil. Develop a list of goals you want to achieve over the medium and long-term.9 This could range from product development to becoming a disruptor in your industry. It’s extremely important to review your strategic business plan from time to time to ensure your tactics are still relevant, and that you’re still on track to reaching your goal.13 Make sure that those in charge are measuring the success of every tactic their teams use to make sure you’re moving in the right direction. Making a good business plan takes many hours of analysis and groundwork that shouldn’t be overlooked. To help you out, we’ve created a downloadable basic business strategy template for you to fill in, in order to set your company off in the right direction. 1 Ong, C. (Jan, 2015). ‘5 benefits of strategic planning’. Retrieved from Envisio. 2 Thompson, M. (2010). ‘Now, Build a Great Business: 7 Ways to Maximize Your Profits in Any Market’. Retrieved from American Management Association. 3 Trammell, J. (Apr, 2017). ‘10 questions to create your company strategy’. Retrieved from Inc.
4 Richards, L. (nd). ‘Four tools used in strategic planning for marketing and sales’. Retrieved from Chron. 5 Lannon, R. (May, 2016). ‘8 tools & techniques to apply to strategic analysis & planning’. Retrieved from Business Analyst Times. 6 ‘Balanced scorecard basics’. (Nd). Retrieved from Balanced Scorecard Institute. 7 Taylor, A. (Apr, 2018). Our favourite business strategy frameworks’. Retrieved from SME Strategy. 8 (Oct, 2011). ‘Five steps to a strategic plan’. Retrieved from Forbes. 9 MacDonald, J. (Dec, 2015). ‘6 steps to create an effective business strategy’. Retrieved from Business2Community. 10 Hull, P. (Jan, 2013). ‘Answer 4 questions to get a great mission statement’. Retrieved from Forbes. 11 MacDonald, J. (Dec, 2015). ‘6 steps to create an effective business strategy’. Retrieved from Business2Community. 12 MacDonald, J. (Dec, 2015). ‘6 steps to create an effective business strategy’. Retrieved from Business2Community. 13 (Oct, 2011). ‘Five steps to a strategic plan’. Retrieved from Forbes. 4 min Kodak went from booming to bankrupt. The reason? A total lack of change management.